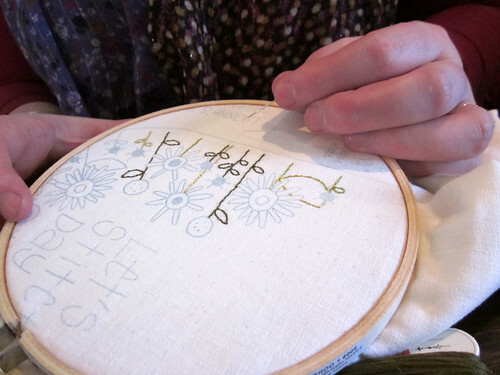 Last weekend i went to a stitching retreat with the lovely Es of Penelope Waits. 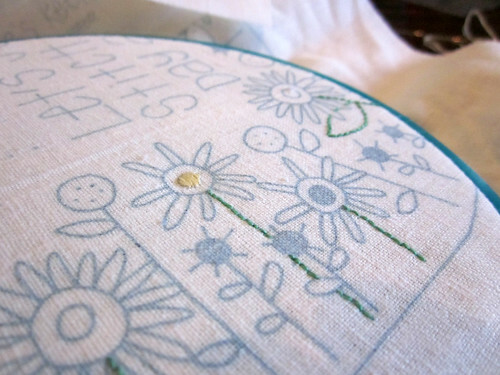 Stitching (a more free-form type of embroidery) is not usually my thing, but it sounded like such a lovely day and it was such a personal and lovely invitation to do something with my darling friend that away we went! 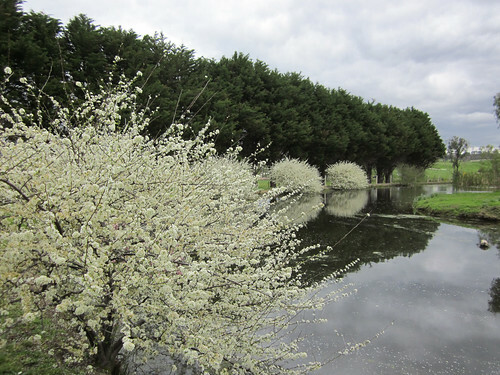 Well it was an absolutely lovely day. 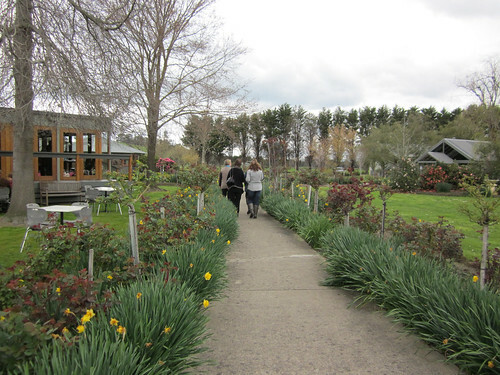 It was held at the Immerse winery near Yarra Glen, hosted by Leanne Beasley of Leanne’s House, and Rosalie Quinlan and Melanie Hurlston of Melly and Me. 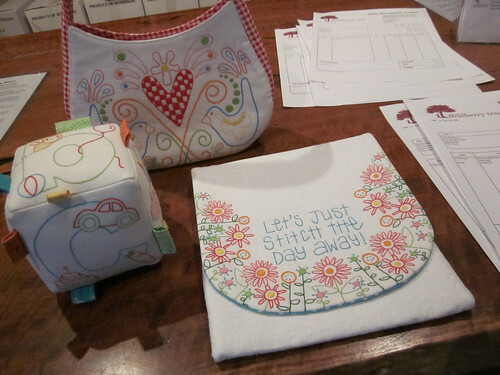 Included in the day’s price was delicious food, a glass of wine or bubbly and materials and patterns for three adorable projects. Es and I both started on the stitchery pouch, although in hindsight i should have started on the baby toy cube (which i have now done) as it’s going to be a PERFECT present for some friends who are expecting! We both purchases some extra colours, since the rainbow supplied was a bit, well, bright. Es went for her usual muted english garden colours while i went for a different kind of bright – rich jewel tones. I learnt how to do 2 new stitches, which was very exciting. Chain stitch and satin stitch. They’re not very neat yet! There were a whole lot of show and tell moments and a few give aways – one of which i won! very exciting! It was a selection of fat quarters from Rosalie’s new fabric range, which i promptly gave to Es since she will get much more use out of them. I think she was pretty happy about this! Some of the show and tells were just amazing! most were quilts, but some were handbags and runners and pillows and of course, Es showed off her fabulous cross stitch designs! We stitched and ate and walked and chatted to the lovely people around us – a little like knitters, but a little more old school crafty 🙂 All in all a lovely day! I came to realise though, that i don’t stitch so much because i need to look at it – i find it a little more solitary than knitting, where i can look around and make eye contact. I do enjoy it though and i’ve been keeping on with both projects i’ve started and am even thinking of stitching a little something for someone for christmas! lovely pics, sweetie. it was great to spend the day with you!